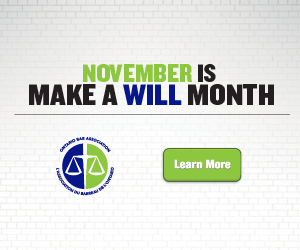 November is "Make a Will Month"
Did you know November is Make a Will Month? 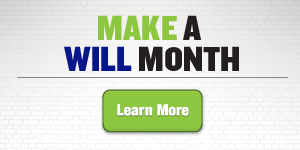 The Ontario Bar Association, of which I am a member, is bringing to light the importance of having a will that specifically expresses your wishes. You’ve spent a good part of your life building your assets and now you have an opportunity to precisely and accurately make sure your assets are distributed as YOU want. Your executor will have the authority to make funeral arrangements, handle business and communicate with your banks and financial institutions immediately after your death. Please take a few moments to reflect on these points. If you haveany questions or would like to schedule a meeting, please contact my office at 1-855-941-5522 ext. 2 or by email: sdeliscar@suzannedeliscar.ca.